For this project you will need 16 mm pearls and bead caps (not included with the files).The height of the finished dress is 2.5". This machine embroidery design is part of our Christmas Freestanding Lace Ornaments collection. It uses the Freestanding Battenberg Lace technique. It will fit the Large hoop (5" x 7"). For this project you will need 12-14mm pearls and bead caps. If you know how to work with Fimo, you can make realistic heads for your lace angels. 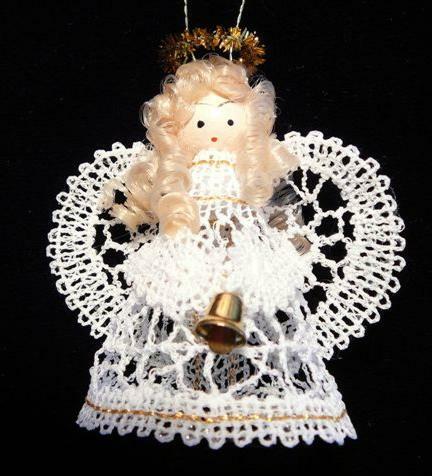 You can read about how to make the angels on the project page. This photo was sent in by Edith Nottingham from Gilliam, Louisiana as her Best Project Contest 2007 entry. To read more about the project go to the customer's page.